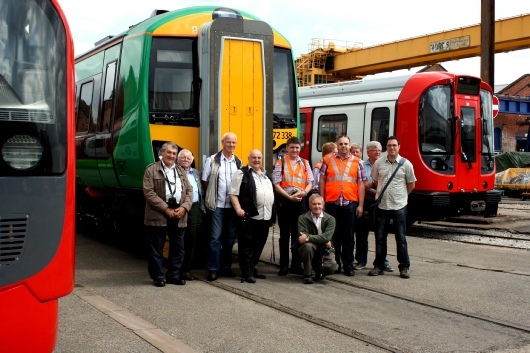 On Wednesday 29th June, our group met at Derby station for the short walk to the Bombardier Works in nearby Litchurch Lane. Prior to leaving the station, 4 ex-DRS Class 20 locomotives (now operated by GBRf) were seen departing for the Old Dalby Test Track to collect an S-Stock unit and transfer it to Amersham on the Metropolitan Line. This was a very appropriate train to witness, as the stock it would be delivering had only recently been built at the Litchurch Lane Works. During the short walk to the works, we noticed two interesting vehicles. One was the ex-San Francisco tram 'plinthed' in an office car park adjacent to the main Birmingham - Derby mainline, and the other was the Networker 'classic' vehicle (number 76112) which is still in existence, despite being many years since it's construction as a prototype. On arrival at the works we signed in, although we had a short delay (probably caused by the earlier visit of Margaret Beckett and other local MP's and dignitaries etc,) before being met by Kathryn Lancaster, who is the Internal Communications Manager for Bombardier Transportation. Class 379 EMU's for Stansted Express. Class 378 EMU's for London Overground. Class 172 DMU's for London Midland & Chiltern Trains. 'S' Stock for the Metropolitan Line. '2009' Stock for the Victoria Line. During the actual visit we were shown the various stages of construction that modern units go through. The frames are delivered to the works by road and indeed several were stabled just inside the security gates as we arrived. Once on site, they go for painting in the dedicated paint-shops prior to being transferred into the assembly buildings. Once inside the assembly building, we saw the entire construction process in action- which starts with the roof sections. This is done upside down (the roof, not the workers! ), to enable the 'many miles' of wiring to be installed. Following this, the air-conditioning units and lighting are installed. The next stage of the process involves flipping over the roof panels and mounting them on to the side frames. After this, the installation of windows takes place, plus internal panelling, lino flooring (or carpets depending on the type of vehicle). The process continues with the fitting of doors, which along with the windows, are leak tested using a high pressure test facility. Should any faults or leaks be detected, then rectification is much easier at this stage of the process! The 'doormen' are a highly skilled group of workers, and are apparently very sought after by other teams within the works. Following this, the remaining internal fixtures are completed. The wheel-sets come direct from Siegen in Germany, although previously they came from nearby Locotech Works. A sad fact of the modern railway! The Class 172 DMU's are fitted with Cummins engines. Each vehicle has a total construction time of 80hours (5 stages of 16hours), and the works are currently manufacturing around 25 cars per week. There are three traversers located around the works which enable vehicles to be moved between the various buildings, one of these dates from 1935 and was painted by Terrence Cuneo. On the eastern side of the complex is a 1.4km test track, which allows speeds of up to 40mph to be achieved. The track is equipped with 25kv overhead, and 3rd/4th rail to allow all vehicle types to be tested. During our visit, one of the new S-Stock trains for London Underground was undergoing testing. For shunting 'new' trains around the yard, three Class 08 diesels are based on site. Two sport a light blue livery and carry internal numbers (003 & 004), whilst the third has been repainted into BR Green, and carries the number D3849. In the week or so prior to our visit, the government announced that Derby Works had failed to win the contract for new the Thameslink trains. However, the staff are still confident of winning the deal to build trains for Crossrail, and thereby securing the long-term future of the works. Our visit concluded with a group photograph in front of some of the stock which has recently being constructed, and which will soon leave the works and be put into everyday use.